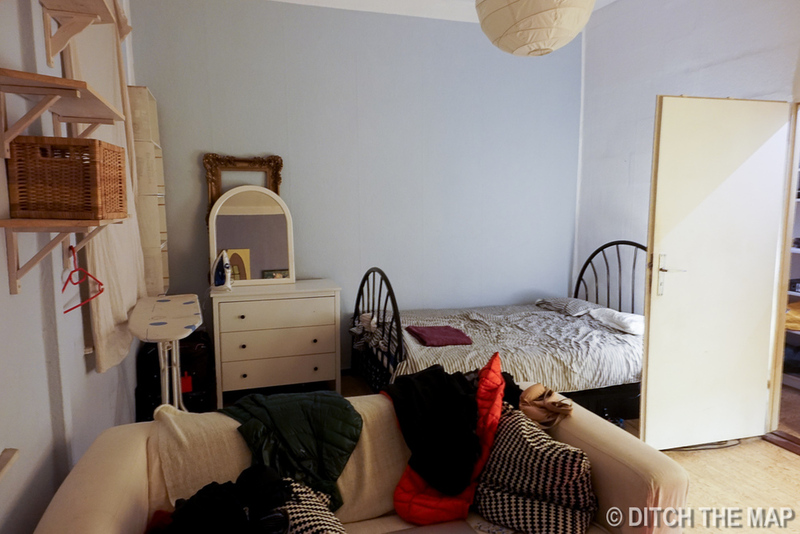 After a 3 hour bus ride from Hamburg we arrived at our Airbnb apartment in east Berlin a bit late. We rang the door bell several times but our host didn't come to the door. We didn't have a contact number for him so we were stuck with nothing to do but wait. We rang other door bells hoping someone would let us in. We began contemplating our other options incase we were unable to stay at this airbnb. Finally a girl came to the door and let us in. Once inside we followed the directions the airbnb host had provided in an email earlier that day, we walked through the first building then a courtyard and into another building to arrive at the apartment. He had said his apartment was on the first floor, the door to the left. We tried the door to our left and after knocking and ringing the bell a rather disoriented German speaking man open the door, wrong apartment! We had forgotten that the bottom floor in Germany is floor 0, or the ground floor. The first floor is actually a level up. We climbed the stairs and tried the correct apartment. No luck. We returned back to the front door of the apartment building, ready to give up, as we saw the host walking toward us. We were so relieved! He showed us the apartment, gave us the keys and left the apartment to us. We had arrived in Berlin on a Friday night and figured we would check out the night life. We asked the owner of the apartment for suggestions and he recommended an area where several warehouses had been converted into bars. Later in the evening, after drinking some yeagermeister, in honor of being in Germany, we walked the neighborhood filled with hipster bars and ethnic restaurants toward the warehouse district. The area is reminiscent of northern liberties in Philadelphia- "up and coming" as they like the say. We reached the warehouse area and could hear music blaring from the large buildings. Spacious walkways weaved between the warehouses. The buildings were covered with graffiti and art work made from found objects like bike tires and the like. 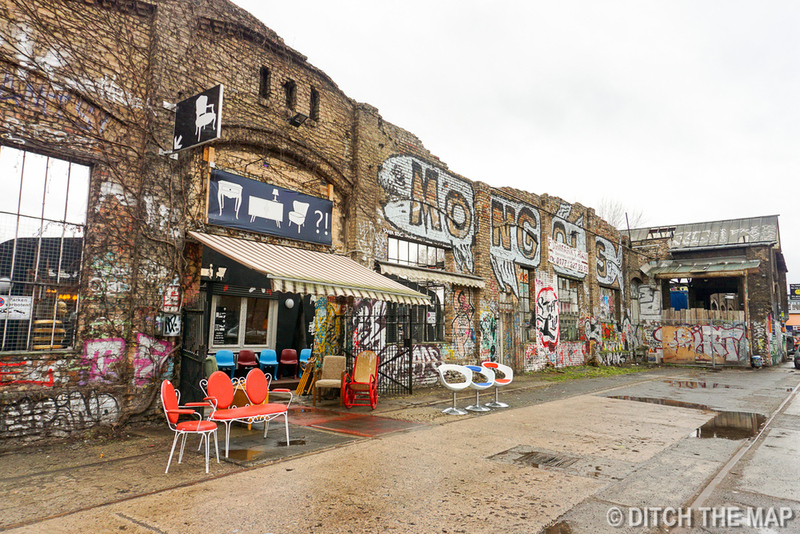 It was pretty much everything we were expecting from Berlin- edgy, cool and hipster. We shared a beer in several of the bars. We were surprised but how cramped and small the bars where considering the buildings were so large. (The bars may have felt even more cramped due to the size of some of the people, many Germans are very tall!) We found ourselves unexpectedly in a gay bar at first. We had thought the boy band posters out front were a bit peculiar...we then wondered over to a bar where trance like music was penetrating the gravel junkyard courtyard out front. We asked at the front what was going on inside- the girls said it was live music for a 5 euro cover charge. We asked until what time the event lasted considering checking it out later, they laughed and said 7am. We stepped in on last bar for the evening and then wondered around the warehouses. We ended the evening around 2am with a burger and sweet potato fries. Click here to read about some great Berlin tours. We slept in late the next morning then set out to see the remains of the Berlin Wall. They call the section that's left, that's just over a kilometer long, the east Berlin Gallery. The wall is decorated with street art with progressive and liberal messages. East Berlin still differs from the other half of the city in the west. It has a smaller population...other facts? We crossed the wall and walked into West Berlin. Like east Berlin the streets were very wide and the buildings were large and spread out. We went to the Jewish museum and then check point Charlie. We laughed at the strategic placement of McDonald right across the street from Checkpoint Charlie's. They really know how to pick prime locations, there's always a McDonalds! We spent our third day in Berlin exploring the downtown area of Mitte. This area is where the major attractions tourist attractions are- many post WWII constructions with a large and modern feel. We actually found that the neighborhood where we were staying had a lot more character than the center of the city. We made dinner each night. One night we made sushi and balsamic chicken with sweet potato fries. We walked around to take in some sights. After being in so many cities these types of things begin to blend together. It's the culture, food, conversations, etc. that really make a place what it is! I (Scott) absolutely love Berlin. It's actually exactly what I thought/expected it to be. It's such a unique city...a multinational melting pot. Young, energetic, vibrant, expressive, artistic, intelligent, conscientious, and quirky city! I had read about an English language comedy show that occurs twice a week. I marked my calendar and told Sylvie we were going to go on Monday. We took a subway and transferred to another to get to Mitte, the area where the comedy showcase was. We paid our 6 euro entrance fee, which included a free shot and all you can eat pizza--we got out share of pizza. Sylvie and I devoured no less than 5 pieces of pizza each. The comedy was absolutely hilarious, which was a pleasant surprise given the low entrance price. The atmosphere was young and lively. Many of the people where smoking cigarettes, as this is legal in Germany. The vast majority of people in the bar where not travelers. However, they all spoke English. Many of the people where transplants either working or studying in Germany. Many of them spoke German...or where at least learning to speak German. Sylvie and I missed a few of the jokes as they referenced Berlin's neighborhoods or where in pure German. Listening to the standup really made me reflect on my experience(s) in Germany and most recently being in Berlin. Sylvie thinks she may in fact be German because she doesn't like loud noises, lives for following the rules, and find rule and order very important. I find this funny! I will list the comedy acts at the comedy show because I feel it truly reflects the true nature of Germany (Berlin specifically). Germany is the most diverse and culturally accepting place I've ever been!